Hey everyone, we are excited to announce that we will be attending Phoenix Comicon Fan Fest Dec. 4-6, 2015 at the University of Phoenix Stadium! A Special Thanks to Matt and Kellie for making this all happen!! We will be in Artist Alley at Table A348! 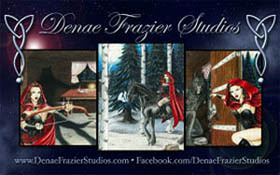 At the event, we’ll be selling Denae’s 6.75”x10.5” & 11”x17” LE Art Prints, 1/1 Original (ACEO 2.5”x3.5”) Sketch Art Cards, her Comics and some of her 11”x17” Original Art. And If you’re wanting to know what’s going to be where at the upcoming Phoenix Comicon Fan Fest..Click here: http://bit.ly/1LtvSrf. See you all there!! This entry was posted in appearances, art, custom illustration, events, news, star wars and tagged 1/1 Original Sketch Art Cards, 11x17 LE Art Prints, 6.75x10.5 LE Art Prints, ACEO 2.5x3.5, Comics, disney, Original Art, PCCFanFest2015, Phoenix Comicon Fan Fest, Star Wars, The Nightmare Before Christmas, University of Phoenix Stadium. Bookmark the permalink. Trackbacks are closed, but you can post a comment.